WASHINGTON — Surrounded by members of Alaska's congressional delegation, President Donald Trump on Friday signed an executive order that directs the Interior Department to rethink some of President Barack Obama's regulations and decrees that put large swaths of the Arctic Ocean off limits to oil drilling. The order requires Interior Secretary Ryan Zinke to review previously issued five-year development plans for offshore oil and natural gas leases and regulations governing oil, gas and renewable energy leasing in waters of the Arctic and Atlantic. The new move holds potentially big changes for Alaska: reopening the option of future Arctic Ocean drilling, a reversal of the Obama-era approach that sought to limit and eventually ban offshore drilling there. The executive order only outright rescinds one of Obama's orders, pertaining to the Bering Sea, issued on December 9, 2016. Actions related to the Beaufort and Chukchi Seas from 2015 and 2016 are modified, rather than rescinded, confirming status as a marine sanctuary, but not barring leasing and drilling. In all cases, the Interior Department will have to rework its five-year plan for oil and gas leasing — an effort that will take up to two years. The Interior Department will also review oil and gas regulations for offshore drilling, though the outcome is undetermined. The order begins the process of opening more offshore areas to energy exploration, Trump said, adding that it "reverses the previous administration's Arctic leasing ban." Trump said the moves would create revenue and jobs and enable better scientific study of offshore resources. "We don't have to start from scratch," Zinke told reporters Thursday night. He said that the current five-year plan will remain in place in the meantime, and a review will likely take at least two years. Zinke said the Interior Department is planning no set outcome of the review. "We're going to give local communities a voice," he said. The president signed the order in the Roosevelt Room of the White House, under a portrait of the room's namesake, Republican President Theodore Roosevelt. Alaska Sens. Dan Sullivan and Lisa Murkowski and Rep. Don Young were present, among others: Zinke, Commerce Secretary Wilbur Ross, National Economic Council Director Gary Cohn, Vice President Mike Pence, and several other White House staffers and members of Congress, according to a press pool report. Murkowski said lawmakers from Louisiana, Oklahoma, Texas and South Carolina were present. 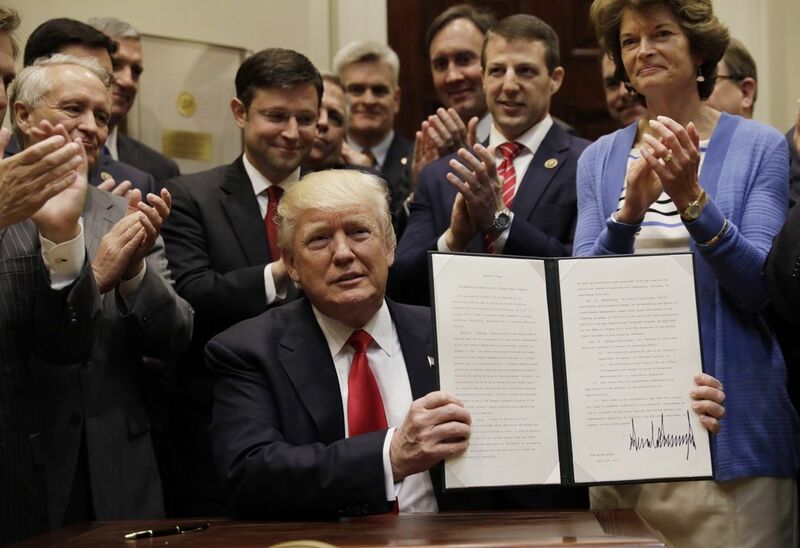 Murkowski, chair of the Senate Energy and Natural Resources Committee, stood next to Trump as he signed the order, and nudged him to share the state motto: "North to the future." Trump focused his remarks on Arctic drilling, and reversing the prior administration's ban on Arctic leasing. He said the move would produce jobs. After signing the order, Trump handed the pen to Murkowski. While concrete change stemming from Friday's executive action will take years, Murkowski said she was most heartened by a provision at the start of the order. Section 2 of the order states: "It shall be the policy of the United States to encourage energy exploration and production, including on the Outer Continental Shelf, in order to maintain the Nation's position as a global energy leader and foster energy security and resilience for the benefit of the American people, while ensuring that any such activity is safe and environmentally responsible." That's the real, immediate change evident in the order, she said: a "policy objective that clearly outlines the country's energy goals." Such a "clear direction" was missing under the Obama administration, Murkowski said. Murkowski said she is hopeful that the changes in the order will put an "open for business" sign on America's Arctic waters, and that oil companies will feel that "there is a regulatory process they can count on." "I think it's a big day for America," Young said in an interview. He noted that other nations, such as Norway, Russia and China, are all "already deeply involved" in Arctic drilling. "We are still the best oil explorers, developers and drillers in the world," Young said. He argued that the U.S. has a better environmental record than Russia, and should be dominating the inflow of capital to the Arctic region. Young said he hoped the order would encourage drillers like Conoco and Shell to take another look at exploring in Alaska's offshore Arctic waters. Sullivan, speaking via phone on his way back to the Capitol from the White House, said the executive order acted as a swift delivery of a December promise made by Vice President Mike Pence. After then-Interior Secretary Sally Jewell announced the administration's plans to close Arctic waters to drilling, Sullivan said he called and texted Pence asking for help revising the regulations. The next time he saw Pence, Sullivan said, the vice president-elect told him the Trump administration would reverse the ban. Environmental groups that oppose Arctic drilling piled on to oppose the order before the text was even released Friday. "Donald Trump is once again showing that his presidency serves the interests of giant oil companies over the health, safety and future of people across the United States," said Gene Karpinski, president of the League of Conservation Voters. "Allowing Big Oil to expand offshore drilling to the Atlantic, Arctic and Pacific oceans would put coastal economies and ways of life at risk of a devastating oil spill, while worsening the consequences of climate change." "President Trump's order could put the Arctic Ocean — and Alaska's sensitive northern coast — at risk of a major oil spill," said Lois Epstein, a licensed engineer and Arctic program director for The Wilderness Society. "The Obama administration learned from Shell's disastrous record in Alaska, and realized that industry is incapable of safely mobilizing and drilling in such an extreme and sensitive environment," Epstein said. "President Obama recognized that the Arctic Ocean is important for more than just oil and gas." Environmental groups argue that the remoteness of the area and its relative lack of nearby infrastructure make it a more dangerous place for drilling. The immediate impact on Alaska will be limited, since oil companies have not been angling to drill there recently. Oil companies have given up most of their current leases in the Beaufort and Chukchi seas. But Sullivan said that claims of disinterest by the prior administration are disingenuous, and said it was strict Obama-administration regulations that drove oil companies out of the Arctic first. And he said he hoped that in the immediate, the order would have a "psychological boost" for Alaskans facing serious budget challenges, offering a "sense that the future is bright," and that the federal government is now a "partner in opportunity, not obstacle." Friday's executive order is only a first step toward Arctic drilling, Murkowski said. "We don't have any producers that are sitting poised to move" into the region, she said. Obama used the Outer Continental Shelf Lands Act to "withdraw" offshore acres from the Interior Department's oil and gas program. Each withdraw was for an unspecified period of time, and legal minds disagree about whether the move was permanent. The question will most certainly end up in the courts, following Trump's new action. Murkowski and Sullivan both said they are confident that the Trump administration would prevail in what is an inevitable court battle over the Trump and Obama orders. Jill McLeod, an oil and gas attorney at the law firm Dorsey & Whitney, said the eventual lawsuit will cover an issue untested by the courts, "and it could take years to resolve." If Trump fails in the courts, Congress could open offshore areas through legislation. Murkowski said she's keeping all options open, both on the administrative track and looking for opportunities to advance bills that she has already introduced. Since reopening off-limits offshore area to oil and gas leasing would generate federal revenue, it could be included in the budget reconciliation process, according to analysts at Clearview Energy Partners. Congress can only issue one budget reconciliation bill per year, but it also only needs a simple majority of votes. That means it could pass without facing the hurdle of gaining votes from Democratic senators. 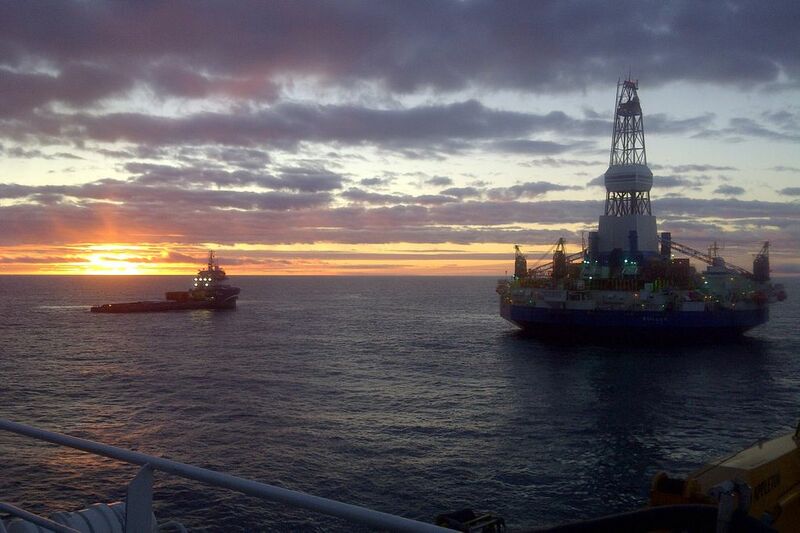 The prospects for drilling in Alaska's Arctic Ocean have been rocky. Shell Oil spent seven years and $7 billion testing a well before pulling out of the project in 2015. Members of Alaska's congressional delegation often place blame on the Obama administration, which they say slowed Shell's path to finishing a single test well. A well rule finalized by the Obama administration required that drillers have a backup rig on hand to provide relief in case of an emergency — a costly prospect that shines a light on the lack of local infrastructure available in the far north of Alaska. Green groups, to the contrary, blame Shell for its own "blunders" during its drilling attempts. Shell's problems included failed air pollution tests, a drifting rig, a fire and other rig violations, according to The Wilderness Society. They say the stakes are higher in the Arctic, where a sensitive environment and seasonal ice could make any spill a greater disaster than it would be elsewhere. "The Arctic is fragile and remote with little to no infrastructure – the nearest Coast Guard is 1,000-miles away," said Kristen Miller, the interim executive director of the Alaska Wilderness League.